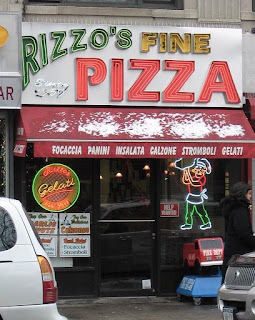 Rizzo's, known for their square "Grandma" pizza is celebrating its 50th Anniversary this Saturday, May 30th. In honor of their big 5-0, they'll feature 50's prices (well almost) with $.50 slices of pizza, Italian ices and soft drinks from 12 p.m. - 5 p.m. Quite a deal for this iconic pizzeria, which is loved and respected by our community. If you haven't yet checked it out, I hope this deal encourages you to do so. In addition to all the savory pizzas, they also serve a pizzetta Nutella with hazelnut cream (Nutella), dark chocolate chips and powdered sugar. Yum!